Click here to purchase tickets for our upcoming concerts now! Holly is a London- based flautist, teacher and educational worker, and plays a number of flutes and non-Western flutes. Her performance in this area includes deputy work on shows including the Lion King, Oliver! (The Curve), Thursford Christmas Spectacular, and a season at Regent’s Park Open Air Theatre, playing flutes and whistles in the onstage band in The Beggar’s Opera. She performed live on BBC Radio 3 In Tune with the cast and band from Regent’s Park. Holly also played in ENO’s John Cage Musicircus at the London Coliseum on Chinese flutes, and the performance was broadcast on Late Junction. Holly has played a variety of flutes on a number of recordings, including Katie Melua’s album Ketevan (2013) with Mike Batt and Docklands Sinfonia, and on three albums with folk band Skinny Lister on whistles. She also works on various recordings with composers for commercials, art installations and animations. Other career highlights on ethnics have included a performance of Hoketus by Louis Andriessen on panpipes at the Spitalfields Summer Music Festival, and performances of three works by film and theatre composer Nick Bicat on bansuri and whistles. Holly is delighted to have been selected as an artist for Making Music Concert Promoter’s Group on two occasions. She enjoys working regularly with pianist Helen Nicholas, and as part of her duo ‘Syrinx’ with harpist Tamara Young. With these duo partners, Holly has given recitals at the Royal Opera House, St Martin-in-the-Fields, Cheltenham Town Hall, the Barber Institute of Fine Arts (Birmingham University) and for many concert societies in the UK. Holly is also an artist for Concordia Foundation, with whom she performs regularly. Having been awarded the position of Richard Carne Junior Fellow at Trinity Laban Conservatoire of Music and Dance (2011 – 2012), Holly developed her work on ethnics and undertook study and performance in this area. She was also awarded an Emerging Excellence Award from Help Musicians UK in 2012. Holly was delighted to use the award to support further study and performance on ethnics and whistles. Holly graduated with a distinction in performance in her MMus from Trinity Laban in 2009, where she studied with Anna Noakes and Tony Hinnigan. She was awarded a Leverhulme orchestral mentorship with the BBC Concert Orchestra and principal flautist Ileana Ruheman during her Postgraduate studies. Holly received her BMus (hons) from the University of Birmingham, where she was also awarded a concerto prize during her final year. 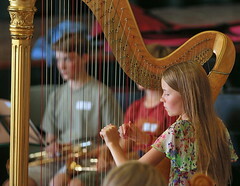 As a younger musician, she was Peterborough Young Musician of the Year (2001). Holly has gratefully received scholarships from Help Musicians UK (formerly MBF), the Richard Carne Trust, EMI Sound Foundation, the Leverhulme Trust and the Elizabeth Wright Charitable Trust. Broadstone Music Series is a charity supporting music in Broadstone. We aim to provide high quality musical experiences for all in the local area. For String, Brass and Piano! Enter your email address to follow us and receive updates by email. Broadstone Music Series & Poole Society for Young Musicians values the individuality and contribution of all persons engaged in the activities and is committed to ensuring that all are treated with dignity, respect, sensitivity and equality. We are committed to safeguarding and promoting the welfare of children and vulnerable adults and will ensure its actions and activities reflect this.